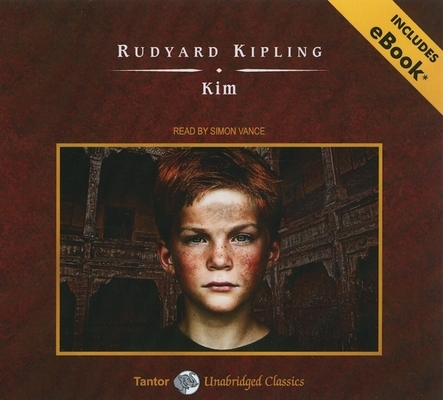 "In all India is no one so alone as I " Rudyard Kipling's Kim is the story of Kimball O'Hara, the orphaned son of an Irish soldier, who spends his childhood as a vagabond in Lahore. With an old Tibetan lama he travels through India, enthralled by the "roaring whirl" of the landscape and cities of richly colored bazaars and immense diversity of people. The novel is a masterpiece of careful organization and skillfully manipulated narrative techniques. By portraying Kim's utter devotion to the lama and his ability to share the life of the common people intimately and unself-consciously, Kipling creates a vision of harmony-and of India-that unites the secular and the spiritual, the life of action with that of contemplation. Short-story writer, novelist, and poet Rudyard Kipling (1865-1936), the first Englishman to receive the Nobel Prize for Literature, is the author of such popular works as "The Jungle Book," "Kim," and "The Man Who Would Be King." Simon Vance has recorded over four hundred audiobooks and has earned over twenty "AudioFile" Earphones Awards, including for his narration of "Scaramouche" by Rafael Sabatini. He is also the recipient of five coveted Audie Awards, including one for "The King's Speech" by Mark Logue and Peter Conradi, and he was named an "AudioFile" Best Voice of 2009.